Excellent app. Download a breeze. Very informative on management of finances plus excellent coverage for retirees. 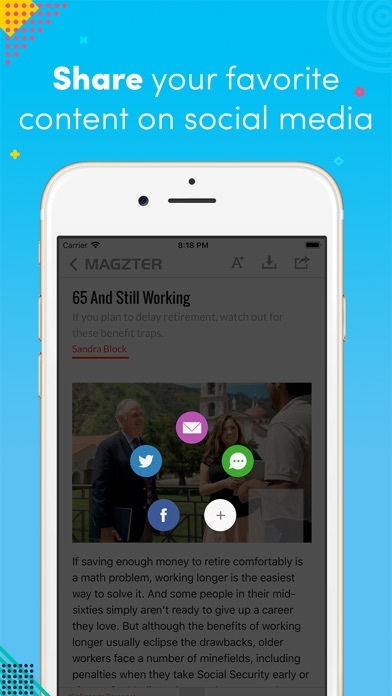 This app is a way for someone to buy individual magazines. If you have a subscription... this will not work. If you do have a subscription. Go to your browser on the mobile device go to Kiplinger.com. There you can log in and get mobile ready versions. Subscribed. Read two issues. Had to change password. When I entered my email (about a dozen times) to have a reset email sent to me, nothing came in. Checked the junk email. Nothing. Tried to re-register but my email is already in use. REALLY??!! No access for print subscribers. Ridiculous. You don't have to be a personal finance expert to know that's a ripoff. Subscribed for a year and auto-renewed. Following renewal, could no longer access it...paid for it and got nothing. Apple says contact them for issues but then tries to pawn you off on the app developer...not worth the trouble. Like all the other reviews say, your hard copy subscription won’t get you access here. This app is useless to current subscribers unless you want to pay twice. Subscribe to Kiplingers digital and get a .pdf of the magazine through the web. This app requires a second subscription. Waste of effort. My account indicates that I am paid through December 2018 but I cannot download the current edition of the Kiplinger Personal Finance magazine. The email that I sent to support requesting assistance has gone unanswered. Spend your hard-earned money elsewhere. 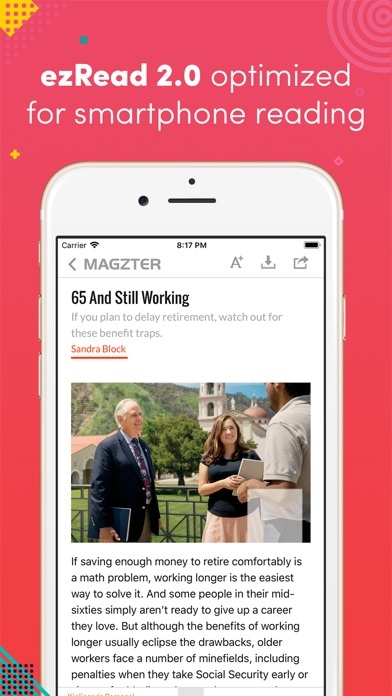 Do not use this app from Magzter. I get Kiplinger’s print edition but I can’t get the digital version without having to buy each issue!!!! What’s the point? Doesn't cooperate with kindle. Ez read feature only applies to a few articles. I have a hard copy subscription to the magazine but would also have to subscribe to the app to get the same information on my tablet. Don’t quite understand why I have to pay twice. Can not access previous subscription. Too bad. This is a private (pirate)vendor. You would have to pay again. Don't get robbed. I am a long term subscriber to Kiplinger but there is no way to sign in on this app. Worthless. If you are looking for an app to download digital version of your printed edition, you are out of luck with this app. 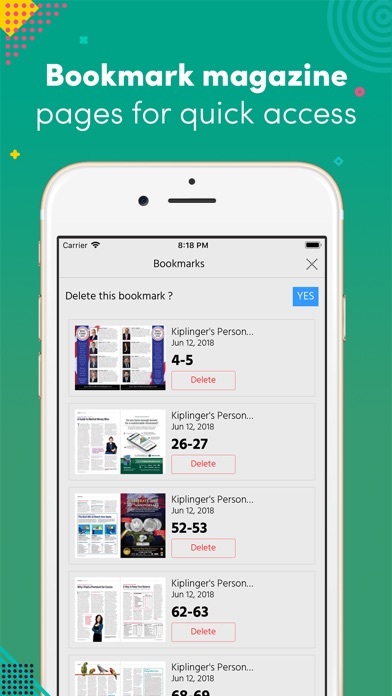 You options are to buy another subscription through this app or download pdf versionfrom Kiplinger's website and view it on iBooks. Kiplinger's can do better ! App is awful. From it, you cannot download issues with a digital subscription (only solution is to download from website and save to iBooks). Just spoke to customer service and he claims that the magazine does not have an app!!!!! Terribly disappointed with this ap. It does not work on my iPad even with correct entry of the required info. Called Kiplinger's customer support and got no help. If I had known this, I would not have subscribed as I read "on the go" on my mobile device. Been a subscriber for years and just assumed I could log online for issues. Not so. Why? Unable to login, period. You must register another account with the app developer. 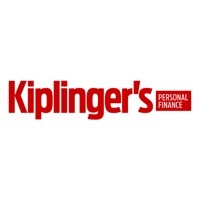 Your account with Kiplinger's won't work. Too complicated! Apparently it's not possible to have print And electronic issues. I got this app shortly after I subscribed to Personal Finance. I cannot login using the app on my iPhone but the same credentials get me into the site from Firefix on my mac. And it obviously isn't just me. Fix the app, guys!! I strongly agree with #1and #2 reviews. Subscription payment was collected from my account but can not sign in. Personal Finance magazine not downloaded at all. Really frustrating. I regret subscribing. No plan to renew after a year, if only I can cancel it (subscription has not started yet). Too complex. Too many subscriptions, too many adds, hard to download or view magazines. I am getting frustrated and probably won't resubscribe. The service is designed for older people, so make it simple. One year later, still doesn't work. I was surprised by the low rating in this. How can this be its just an online access to the magazine. Found out first hand. I can login from web page (assuming I can find the right web page). But cannot login from app. Cannot believe a leading personal finance magazine has such a poor app and online access. Looks like they are counting on non digital subscribers. It's too bad. This is a piece of junk used to capture your email and send you spam on your birthday. Avoid at all cost. While it is nice to be able to read the magazine on my iPad, I'm only reading a print version reduced to iPad for format. Really? How about a version that actually adapts the content to be navigated on a tablet? You will have to subscribe to Kiplingers through the app to access a digital copy. Your print subscription will not allow you to access issues digitally through this app. I have had a print subscription for years. I now have online access to the magazine on Kiiplinger’s web site. Customer support told me that this app isn’t supported. 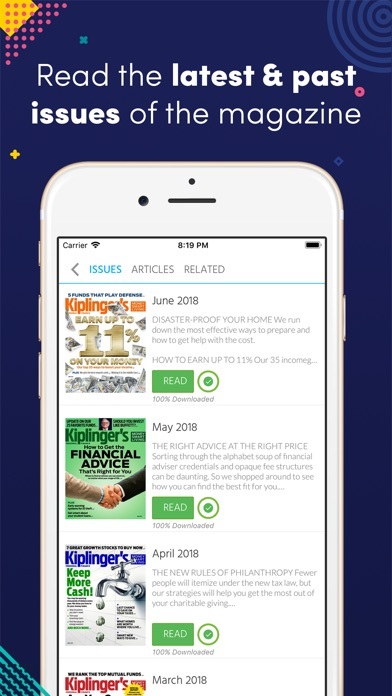 This is one my favorite business magazines and the app works great, downloads very fast and the reading experience is very smooth. Good pricing on the subscriptions, I was expecting it to cost more. ...for one of my favorite magazines. Kiplinger / Magzter does not allow you to have access to magazines that you have already purchased if you do not renew your subscription. This strikes me as unethical. Do not subscribe to this magazine. Bummer. Every other magazine lets you do this. Should have read reviews.. Unusable and unreadable. I am very disappointed. I had a one year subscription to Kiplingers through Magzter. At its conclusion I was unable to access any of the magazines I had through the subscription. Pressing the restore buttons did not bring these issues back. It was as though I've never subscribed it all. If you choose to subscribe to Kiplingers do it my mail. At least that way you will get hard copies. I am not sure I will bother to do that. 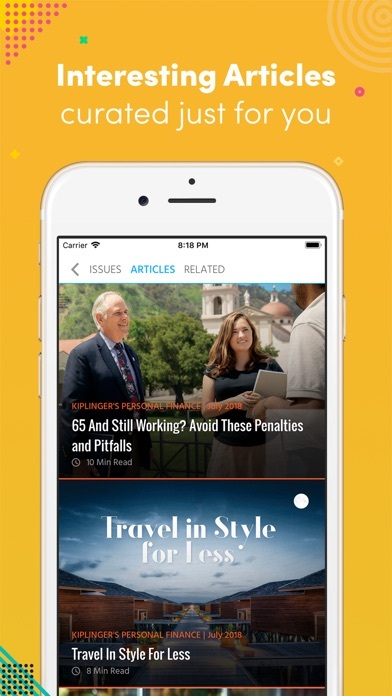 Money Magazine app has a superior interface and the subscription includes hard copies. Thumbs way down to Magzter. I am also disappointed with Kiplingers for not going with a more reliableSecond party to create a decent app. I like the magazine but the App does not allow to email or share articles which are basic functionalities commonly available in many apps like Bloomberg, Economist, HBR and other magazines. I will change the rating if Kiplinger adds these features.